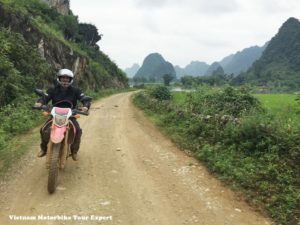 Vietnam Motorbike Tour Expert organizes guided motorbike tours for mostly intermediated and experienced riders. However, there are still someone who never been on a manual motorbikes wanna learn to ride it and join the tour with the friends. Here are some tips for the beginners on how to ride a manual motorbikes. Reading these tips before being on the real bikes must be helpful and help to make the beginners more confident. – Familiarize yourself with the basic controls before riding. When you’re actually riding you will have to think quickly, if you’re not familiar with the operations it could be dangerous. – The hand clutch lever is typically located on the left handlebar and is used to disengage the power from the rear wheel when shifting gears. – The gear shifter is typically located by your left foot and is used to shift one gear up or down while you’re pulling the clutch lever. – The throttle is on the right handlebar and used to accelerate. The handbrake, which applies the brakes to the front wheel, is the lever on the right handlebar. – The lever on the right side of the bike near your foot works the rear brake. – As a rule, the left side of your motorcycle controls gears, while the right side controls acceleration and braking. – To properly get on your bike, face the motorcycle from the left side. Grab the left handlebar, and swing your right leg over the seat. Plant your feet firmly on the ground. – The best way to get to know how a bike operates is to sit on it and go over the functions of the controls before starting it up. – Get a feel for how you fit on the motorcycle. Grip the handlebars, clutch lever and brake lever. Make sure you can reach these controls comfortably. Your arms should have a slight bend in the elbow when gripping the handlebars. Switches should be within easy reach of your fingers. – The clutch is used to change gears. When you pull the clutch in, you’re releasing the engine from the transmission. This action puts your bike in neutral, allowing you to shift gears. – Think of your clutch as a dimmer switch when using it. Unlike an “On-Off” switch, you want to gradually and smoothly pull and release the clutch to prevent your bike from stalling. – When starting, pull in the clutch lever and put the bike into 1st gear by pushing down on the gear shifter with your left foot. You may have to push down several times. You’ll know you’re in 1st when you don’t feel any more resistance or indication the gears are moving. – Most motorcycles operate in a “1 down, 5 up” shifting pattern. The pattern is typically 1st gear, neutral, 2nd gear, 3rd gear, and so on. When shifting gears you will see the appropriate number light up on your gauge. – When you’re driving, you should shift gears by first pulling on your clutch with your left hand to disengage the rear wheel. As you pull the clutch, reduce the throttle. Reducing the throttle will prevent your bike from jerking as you re-engage the rear wheel. Continue by shifting gears with your left foot. Feather the throttle with your right hand to keep the transmission smooth. Finally, release the clutch, engaging the rear tire. 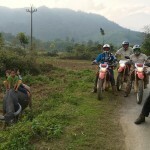 – Once the engine has started and warmed up, you can begin to ride. This is done by shifting down into 1st gear and letting the clutch lever out while simultaneously pulling back on the throttle. – Make sure your kickstand isn’t out. – Slowly let out the clutch lever until the bike starts to roll forward. – You may have to pull back on the throttle slightly to prevent your bike from stalling while releasing the clutch. – Once you are moving, accelerate slightly and pull you feet up onto the pegs. – Try straight line riding. As you let the clutch out and slowly roll the throttle back to pick up a little speed, continue riding in a straight line. When you are ready to stop, pull in the clutch lever, and slowly apply the front and rear brakes simultaneously. Use your left foot to steady the bike at a stop. When you are stopped, put your right foot on the ground. – Once you’re able to start riding in a straight line, get a feel for shifting. Get a feel for the “friction zone”. The friction zone is the area of resistance created as the clutch becomes engaged. This area allows for the transfer of power from the engine to the rear wheel. Motorcycle transmissions are sequential, meaning that you have to shift one gear in a consecutive order, whether shifting up or down. It will take some practice to be able to feel and hear when it’s time to shift. The engine will start revving at higher rpms when it’s time to shift. – With your bike on, shift all the way down into 1st gear. You’ll know you’re in 1st gear when the shift pedal doesn’t click down anymore. You should hear a bit of a clicking noise when in 1st. – Very slowly let your clutch out until the bike starts moving forward. When you want to start moving faster, pull back on the throttle slightly as you let out the clutch. – To get to 2nd gear, pull the clutch back, ease off the gas, and pull up firmly on your shifter to move through neutral. Check to make sure your neutral light is not on. Let the clutch out and engage the throttle again. Repeat this process to shift through higher gears. – After 2nd gear, you don’t have to pull up with your left toe quite as hard since you’re not going through neutral. – To downshift, release the throttle, squeezing the brake lever slightly. Pull your clutch in and press down on your shifter. Then let out your clutch. – Once you get a hang of downshifting, you can come to a stop while in second gear. Then, once at a stop, shift down again into 1st. – Finally, now that you’ve practiced starting, shifting, and turning your bike, you need to know how to slow down and come to a stop. Remember that the lever on the right handlebar operates your front brake, while the brake by your right foot operates the brake for the back wheel. As a general rule, you want to begin braking with your front brake and employ your rear brake after to help you slow and stop. – When coming to a full stop, it’s best to begin with your front brake and apply the rear brake after you’ve slowed down some. – As you slow down, make sure you downshift. You don’t always need to go all the way into 1st gear. You can downshift into 2nd gear and stop before shifting down to 1st. – Pull in the clutch when braking and gearing down. – Apply pressure to both your front and rear brake as you slow down and begin braking. Make sure you aren’t pulling back on the throttle. This is made easy by the fact that the front brake handle is situated so that you have to roll your hand forward to reach it. – Gradually increase pressure on your brakes, don’t engage the brakes completely, this can cause your bike to stop abruptly and jolt. – Once you are at a stop, keep the front brake engaged, and plant your feet firmly on the ground. Start with your left foot, then your right. Finally, As an experienced riders, we would like to share riding a motorbike is not so difficult but to ride well and safe is not easy. 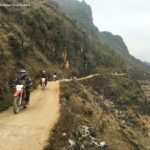 Especially, you would need to learn many more skill to have safe ride on some roads with busy traffic or on some dirt tracks, slippery trails… We hope these tips help a bit and we would like to say most of our tours are suitable only to intermediate and experienced motorbike riders. Good luck from Vietnam Motorbike Tour Expert.